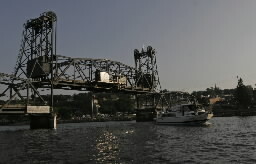 Users of the Stillwater Lift Bridge excited the prospects that the crossing over the St. Croix River may open early can put those hopes to rest. The bridge is scheduled to open Dec. 14, and "it will not open early," said T.K. Kramascz, director of Communications and Public Affairs for the Metropolitan District of Minnesota Department of Transportation. The bridge connecting Stillwater and the western Wisconsin community of Houlton shut down in September for repairs to concrete, electrical and mechanical components.The work also includes painting portions of the bridge and replacing guardrails and curbs and gutters. During its three-month closure, motorists have been directed to use crossings at Hudson and Osceola. Some media were reporting that the work might finish early December. but Kramascz said the opening date has always been Dec. 14 and that date is firm.